Some of the beaches here in Maui are not very well known. One particular beach, who's name we will not reveal (well maybe if you book us!) is in Makena and accessed via a rocky path that looks like it's going into a private backyard but actually leads to a pristine sandy paradise of fine sand and deep azure ocean. The narrow path tends to keep the groups with large coolers away and we often bring our smaller groups down for a sunset wedding. 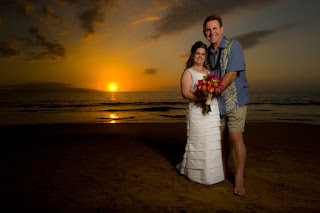 Such was the case last night with Christy and Dennis, who had a magnificent sunset and wonderful Maui wedding. For information on the perfect secluded spot for your nuptials, feel free to call us at 1-808-242-1100 or drop us an email. You'll be as happy as Christy and Dennis!